Research proves that businesses with beautiful indoor plants have more productive workforces, less employee down time and portray a higher company image. 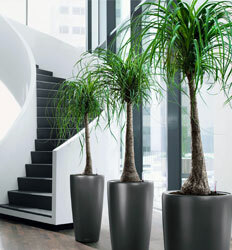 Smart companies outsource their interior design and maintenance service tasks to a company specializing in plant care. Companies in the San Diego and Orange county area who want a company with a proven track record of expertise and personalized service choose Interior Green Jungle, Inc.
Green Jungle is looking for business partners to invest in the franchise development of Green Jungle Inc. In having extensive restaurant franchise experience as a franchisor and franchisee, I feel extremely confident in the success for Franchising this concept. Knowing the dynamics that it takes to be successful in the franchise business, and after 12 very successful years in the interior plant business, this is a very optimal concept to franchise. The first and most important step is finding the right partner. If you would further information, or start a dialogue.